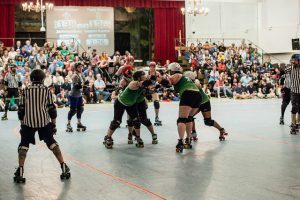 Welcome to the 2017 Atlanta Rollergirls season opener! Whether you are a seasoned fan or a first time derby watcher, we are glad you’re here. With 21 new skaters joining the ranks of ARG, this year promises new skills, new matchups, and a lot of excitement on the track. 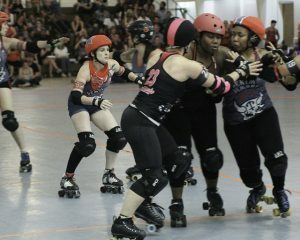 Today, we have Ramblin’ Wrecker here with the bout previews for this weekend. We hope you’re excited about them as we are! Led by all-star captain Eiffel Power, the Shocks will be looking to start the season strong after a tough loss to end 2016. New draftees include Instant Karma, a transfer from Middle Georgia and definitely one to watch. Sakes captain Ruby Chaos looks to help her team bounce back this year after a tumble in the standings at the end of last season. They strengthened their jammer lineup with Dr. 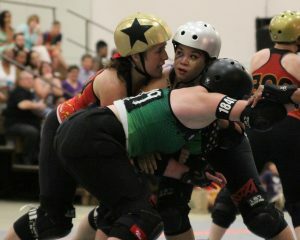 Evil, a late transfer last season who joined DSDG for the WFTDA Playoffs. The second bout of the evening features the reigning 2016 champs, the Apocalypstix, as they begin the defense of their title led by captain Queen Loseyateefa. Building on an already formidable roster, the Stix picked up a lot of new talent this season, including former banked-track skater Hermione Danger from the TXRD Lonestar Rollergirls. The Demons, led by perennial MVP Human Missile Crisis, will look to avenge the loss that knocked them out of the 2016 champs game. Former all-star jammer Jammunition came out of retirement to join the team in denim- will that be enough to turn the tables on the Stix? Be here for all of the fast paced, hard hitting game play this Saturday! Doors are at 4:00pm, first game starts at 5:00pm! Tickets are available online or at the door! BYOB (no glass) and bring some dollars, because we have some fantastic food trucks lined up! We hope to see you there!